Good news, the weather has finally broken for the better but it took its best shot in early September before doing so. On 2 September we got a good old fashioned thunderstorm that cooled the area down by 5 degrees Celsius in only a couple of hours. It was also less humid, or at least felt that way, as soon as the storm was over. That wasn't the end of the storm however; it was the beginning. We had two typhoons hit Japan during the first two weeks of September with a lot of flooding south of me and 9 people killed. I had a dental appointment on the 4th but the morning of the 5th I was dressed to ride at 6:00 am - it was raining. I dressed early the following Monday and Tuesday, the 11th & 12th, with the same results. What I did manage to accomplish on those two days was to get my air flights from Japan to Vietnam and return booked for my bike tour in January. Trying to book a flight is enough of a problem when you and the agent both speak the same language, when you don't it gets really frustrating. Then it finally happened. I got up early again on the 18th and it was a glorious day for a ride. I rode north on highway 399 to 41 and then north on 35 for 20 Km and returned via the same route. There is a sharp 1 km climb after turning onto 41 and then a 2+ Km one on 35 that fortunately has its summit at the 20 Km mark. The next day I rode the same route but increased the distance to 45 Km round trip. I was able to get out again on the 25th and did the same route but this time I finally was able to cross over the Iwaki City boundary to the north on highway 35 by riding a total of 50 Km, the city limits are at the top of another 1 Km climb at about the 24 Km point. The next day, the 20th, I was dressed and out the door at about 6:00 but it was sprinkling and I went back to bed; the day turned out to be good but I didn't want to start in the rain. I tried a different route on 2 October that was just fantastic. 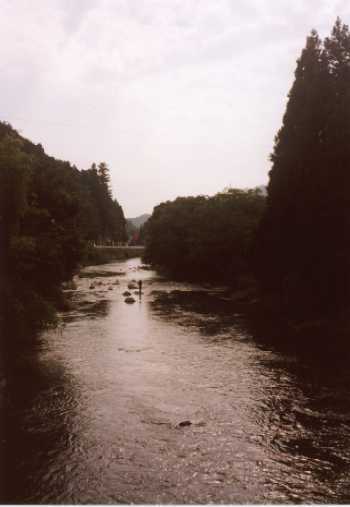 I went north on 399 again but past the right turn to 41, stayed on the road that parallels the Natsui River up into the mountains to the northwest of me, which happens to be 41 northwest. The route is a steady climb with a couple of places that sent me looking for my "granny" but the scenery is just wonderful. 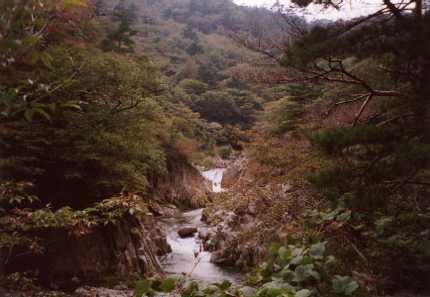 It is a rather narrow canyon and I rode through the Natsui River Gorge and the Setogaro Gorge. I also rode "off the map", I was past the top of my map when I turned around at the 27.5 Km mark; and I got back before it started raining again in the afternoon. On this ride I finally discovered something interesting about my bikes shifting. If you will remember I am using Campy Ergo shifters and derailleur, a Shimano narrow chain, chain wheels that are 24x38x48, and a large freewheel of 30. This is beyond the capability of the rear derailleur so I have shortened the chain by one link (I give up the high 3 gear combinations that I could get with the 24) just to make it work. Well, it never has worked very well! After a lot of problems in Reno and after I rode here in the spring I was considering changing something but didn't know what. So, I took my bike to Yuki here at the shop and told him that I was having a lot of problem shifting into the granny chain wheel; it would jamb between chain wheels or would drop off on the frame side. I left it with him and when I came back an hour later he said it was fixed. Guess what? All the rides I have done this fall have been a dream! All he did was turn the chain wheel over. It seems that the 24-toothed chain wheel is made for wide and narrow chains and Rex, the frame builder, had set it up for a wide chain. I had the mechanics at College Cycling in Reno look at it while I was there and they just said I was exceeding the capability of the derailleur and offered to sell me a lot of stuff that would fix the problem but wouldn't give me what I wanted. 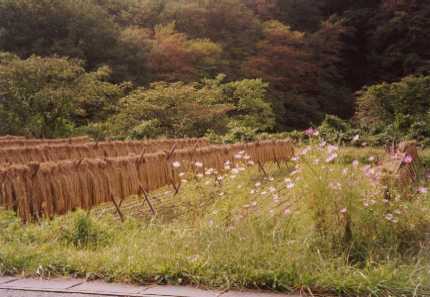 These three pictures show the two different drying methods that are used in this region for the rice harvest. 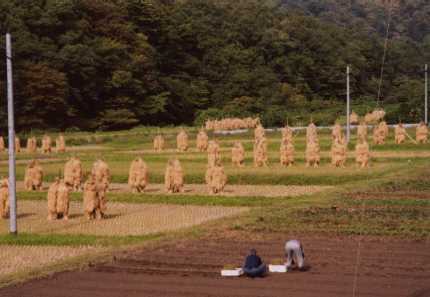 What is unique about these pictures is they were taken of fields that were almost next to each other near the Eda train stop. 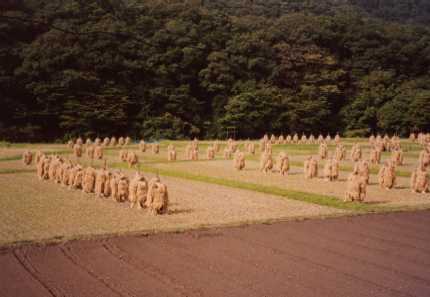 Usually the different drying methods are seen further apart than this but apparently one farmer preferred his way and his neighbor the other. 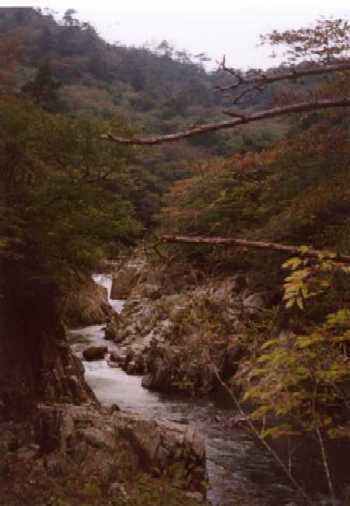 The next three pictures are of the Natsui River Gorge and the Setogaro Gorge; I couldn't see where the one stopped and the other began it seemed to me to be all the same narrow canyon. The pictures below show that the highway (a rather narrow two lane road) and the railroad share the narrow canyon with a few crossings. 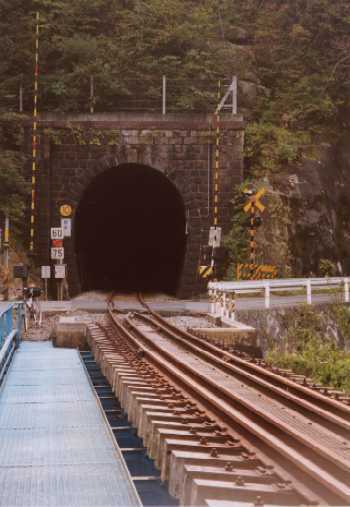 Here is one of them but with the added feature of a tunnel for the trains right after it crosses the road. 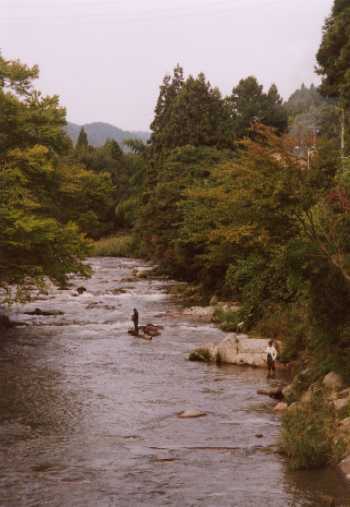 I think of the other two pictures as being 'A River Runs Through It'; in this case it is the village of Kawamae. I took both pictures from a bridge in the village and soon after riding through it I turned around for a marvelous downhill return home. A lot of changes in teaching staff in the last month, as well as the Japanese staff but I don't even try and keep track of them. The new roster,in most time in Iwaki order, looks like this. Head Teacher, Brendan from Sydney, New South Wales. The Chinese-Australian girl, Shasi from Melbourne, Victoria. My former roommate, Dom from Gold Coast, New South Wales, and my roommate, David from near Brisbane, Queensland. Yours truly, from Reno, Nevada. Of the two girls that came in April & May, Laura from Brisbane, Queensland is leaving on the 15th; the other is Lavinia also from Brisbane. The new additions are: Assistant Head Teacher, Larry from Colorado Springs, Colorado; he has been in Japan for about 2 1/2 years and has a girlfriend in Iwaki City so he got a transfer. Another transfer that I think is only temporary, but that may be wishful thinking on my part, Tamara from Tasmania. Then there is Barbara from New York City, New York; she put in a transfer request the first week she was here to get out of Iwaki and into Tokyo. Joining us last week was Wade from near Houston, Texas. So the nationalities have evened up somewhat from me being a token American to the point that we are now 4 versus the 6 Australians. I have the apartment to myself for the next month plus while David is on vacation to Australia, England and Canada, he will return on November 7th. 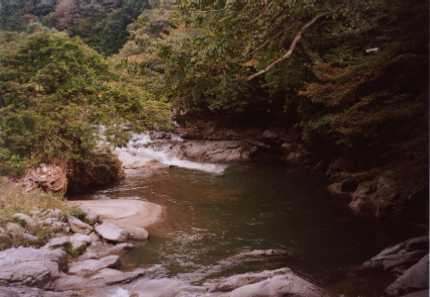 I am planning to take a 4 day vacation to the northern part of Hokaido on November 11 -14. I haven't decided yet where I am going for sure but plan on just doing a loop by train and bus to see some of that area. It is the less populated part of the main island and still has some natural scenery rather than man made structures. I may also get lucky and catch the changing of the leaves; if there is a "leaf peeper" circuit in Japan I think this is it. More about that in future letters.